Some ten days ago I posted the image of the gorgeous rhodochrosite beads I got at BonitaCreations.com . Here is an image of the commission that was created with those beads. 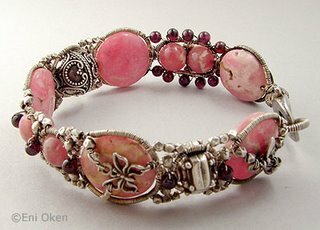 The design is similar to the Spring Bangle with coral (which can be seen clicking here). To see more images of this bangle, click here: Rosa Spring Bangle with Rhodochrosite.